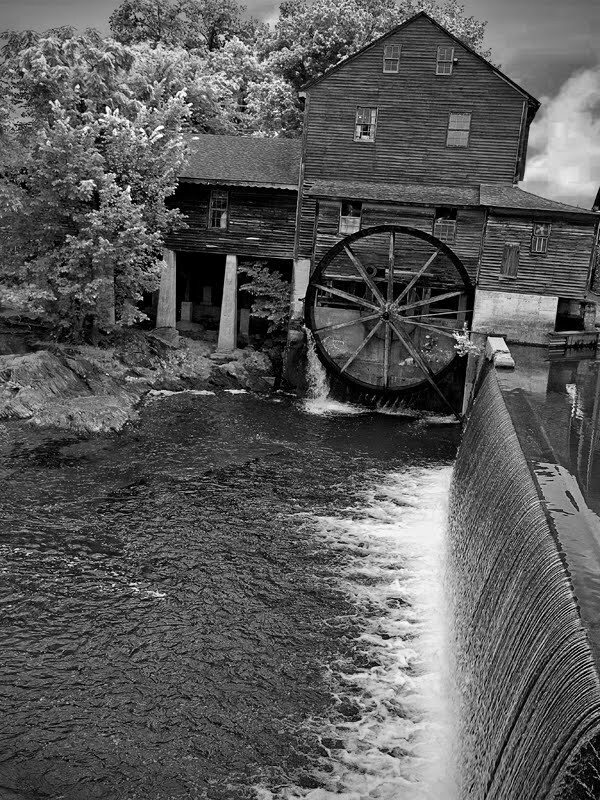 Two different approaches to photographing the old grist mill located in Pigeon Forge, Tennessee. 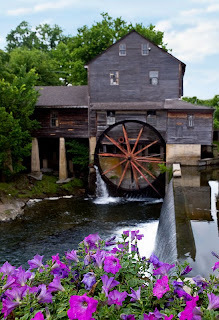 In the early 1800's, a water-powered gristmill on the banks of the Little Pigeon River became one of the main hubs of activity in the small mountain community of Pigeon Forge, Tennessee. In those days, the mill faithfully produced the meals and flours that were crucial for the day-to-day existence of the Smokies' early settlers. 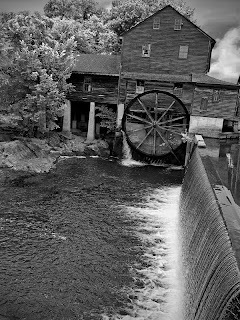 In fact, The Old Mill even furnished electricity for the town until 1935. I like the color version --- very nice! But I also like how the black and white shows so much detail and texture. Do you have one with a straight horizon and all of the tree, like the color image? Hey! I'm at work surfing around your blog from my new apple iphone! Just wanted to say I love reading your blog and look forward to all your posts! Carry on the fantastic work! and facts I wanted about this subject and didn't know who to ask. If some one needs expert view about blogging after that i suggest him/her to go to see this web site, Keep up the pleasant job. It's impressive that you are getting ideas from this post as well as from our discussion made at this place. hello there and thank you for your info – I've definitely picked up something new from right here. I did however expertise several technical points using this web site, since I experienced to reload the website lots of times previous to I could get it to load correctly. I had been wondering if your web host is OK? Not that I am complaining, but sluggish loading instances times will often affect your placement in google and could damage your high-quality score if ads and marketing with Adwords. Anyway I am adding this RSS to my e-mail and can look out for much more of your respective exciting content. Ensure that you update this again soon. It's going to be finish of mine day, but before ending I am reading this impressive article to improve my experience. this article, in my view its in fact remarkable for me. up for the great information you've got right here on this post. I will be coming back to your website for more soon. way of him as nobody else recognize such specific approximately my problem. to “return the favor”.I'm trying to find things to improve my website!I suppose its ok to use some of your ideas!! could do with some % to pressure the message home a little bit, but other than that, that is great blog. A fantastic read. I will certainly be back. What's up mates, nice post and good arguments commented at this place, I am truly enjoying by these. This is a great tip especially to those new to the blogosphere. Brief but very accurate information… Thanks for sharing this one. A must read post! understands what they're discussing online. You actually realize how to bring a problem to light and make it important. A lot more people must read this and understand this side of your story. I was surprised you aren't more popular given that you most certainly have the gift. a little homework on this. And he actually bought me breakfast simply because I discovered it for him.
! But yeah, thanx for spending time to talk about this topic here on your blog. take a massive amount work? I've very little understanding of coding however I was hoping to start my own blog soon. Anyway, if you have any recommendations or tips for new blog owners please share. I understand this is off topic but I simply had to ask. Thanks a lot! What's up friends, how is the whole thing, and what you desire to say about this article, in my view its truly amazing for me. It's great that you are getting ideas from this piece of writing as well as from our argument made at this time. being overlooked as a gay-bashing passage. special approximately my difficulty. You're wonderful! Thank you! to make a very good article… but what can I say… I put things off a lot and never seem to get anything done. you if it's allright. Could it be simply me or does it seem like a few of these remarks look like written by brain dead folks? :-P And, if you are writing at additional online sites, I'd like to follow anything new you have to post. Could you list of every one of all your social pages like your linkedin profile, Facebook page or twitter feed? a related topic, your website got here up, it seems good. Hi there, just became aware of your blog via Google, and found that it's really informative. I am gonna be careful for brussels. I will appreciate if you happen to proceed this in future. Numerous other folks will probably be benefited from your writing. Cheers! I work in the industrial distribution sector as a salesman for a master distributor of valves and fittings in Houston, TX. I am a member of the Bay Area Photo Club which meets at the Art Alliance Center at Clear Lake in Clear Lake Texas on Tuesday nights. I shoot with an Olympus E-3 and my favorite lens in my Zuiko 12-60.